March 1917: The Red Wheel, Node III, Book 1. Aleksandr Solzhenitsyn. Notre Dame: University of Notre Dame Press, 2017. The Bolshevik coup d’état of October 25 (November 7 according to the Western calendar), 1917, is known the whole world over as the Russian Revolution. It is nearly universally considered to be either a liberating event or a catastrophic one, but one that in either case profoundly shaped universal history. Aleksandr Solzhenitsyn was an indefatigable enemy of Communism and all its works, but he considered the major event of 1917 to be the February revolution (to use the old Julian calendar) and not the October coup that flowed inexorably from the overthrow of the tsarist order earlier that year. The February revolution, in Solzhenitsyn’s considered judgment, was a disaster of the first order and not a welcome, democratic eruption in a country ill-prepared for democracy. A reader of March 1917 (Node III of The Red Wheel, the nodes being a series of “narratives in discrete periods of time”) would be hard put to quarrel with Solzhenitsyn’s judgment. As this great work of history and literature attests, February indeed was the root of all the evils to come and not a brief shining display of Russian democracy. The previous nodes, August 1914 and November 1916, centered respectively on the disastrous Battle of Tannenberg and on a deceptive period of quiescence before the outbreak of revolution in 1917, the proverbial calm before the storm. This volume consists of 170 chapters (out of 656 in March 1917 as a whole), most of them relatively brief. One experiences on every page the frenzied pace of events spiraling completely out of control. From the first pages, we confront an emperor incapable of serious thought or action. Even the little tsarevitch Alexei asks why his father is “so weak.” Nicholas is a decent man and a good Christian, but a terribly incompetent ruler. “The family was Nikolai’s favorite milieu.” He preferred to be with Alexandra and the family in “untroubled seclusion.” He regularly attended the Orthodox liturgy, he fasted, and he took Communion. He cared for the Russian people in his own way. But he was absolutely oblivious to approaching disaster. Matters are made much worse by the fact that Russian liberals see no enemies to the left. In addition, they confuse the incompetence and mediocrity of the governing authorities with treason and a deliberate desire to weaken the war effort and to keep bread from the people. This is the official line of the Constitutional Democrats (the “Kadet” party), the left-liberal opposition that dominates the Duma and refuses ever to give the government the benefit of the doubt. It is in a permanent state of rebellion, representing an educated “society” (one remarkably indulgent toward terrorists and extremists over the years) that sees no need for a state that truly governs. Genuine liberals and moderates, not to mention enlightened conservatives, are rare indeed. Nullities, demagogues, and brash revolutionaries abound in Petrograd at the beginning of 1917. And the Duma is dominated by irresponsible rabble-rousers who like to hear themselves talk. The revolution begins with bread riots and the smashing of bakery windows in the capital on March 8 and 9, 1917. Bread is still available but rumors abound that it is being deliberately withheld by the government and uncooperative peasants. The real problem, as Solzhenitsyn makes abundantly clear, is the price controls that have locked up the grain market and were imposed with the support of the Duma. The left-liberals in that body don’t know the slightest thing about supply and demand and the workings of a modern economic order. In the Duma, self-obsessed parliamentarians never really address “the food question” per se; instead, they brutally denounce the authorities and spin wholly unconvincing conspiracy theories. When faced by a thoughtful, knowledgeable, and effective minister of agriculture, Aleksandr Rittikh (a protégé of the great conservative reformer Pyotr Stolypin), they either ignore him or dismiss his proposals to put the country above party and ideology. Rittikh, one of the heroes of the book, stuns the left wing by speaking in an utterly authoritative manner. No mediocrity, he. For the Left, tsarist ministers could only be “foolish, dense, mute, and fearful” (Solzhenitsyn’s words), and Rittikh, a faithful heir of Stolypin, “violated their entire code.” Rittikh knew that the food question could be addressed not by forcibly seizing the peasants’ grain but by freeing up prices and, in the short term, appealing to the peasants’ sense of civic duty. His is the path of enlightened statesmanship. But for the opposition, denouncing the government in the most vociferous and irresponsible manner took precedence over solving the food problem. Meanwhile, street bullies began to break store windows to protest an alleged shortage of grain in the capital. Demagoguery fed violence and violence led to inebriated crowds’ tearing down the entire edifice of civilized order. All this occurred in a country where there was a lively, well-organized political opposition and freedom of the press. The bulk of the army and peasant Russia had nothing to do with this grotesque display of revolutionary nihilism—it was the work of educated “society” in conjunction with criminals and the most questionable people from the Petrograd underworld. There was nothing noble, nothing conducive to democracy or self-government, about the intoxicating violence that Solzhenitsyn so vividly conveys in chapter after chapter of March 1917. In Chapter 44, the ex-Marxist turned defender of political moderation Pyotr Struve speaks for the author when he points out that no freedom is possible without a “sense of measure.” “The possibility of freedom is not the same as freedom.” The tsarist regime is anemic or worse—but not particularly wicked or tyrannical. Struve says that the leftist opposition, dominated by faux liberals, has rejected “the normal evolution” of Russian society and instead opted for a “political earthquake.” They might be right that a “state cannot stand without freedom.” But they have forgotten, if they ever knew, that “freedom cannot stand without the state.” Struve, again speaking for Solzhenitsyn, exposes the “flaw” in the Left’s consciousness: “living in our own country in a permanent state of rebellion.” This, together, with the regime’s lack of will, is the root of the disorder. Struve’s brilliant insights remain relevant for Russia today. As Solzhenitsyn pointed out in his last major interview, with Der Spiegel in July 2007, Russia desperately needs a real opposition, not just the Communists. But this opposition cannot be merely “oppositional” or pining for yet another revolution, one bound like all the others to have tragic consequences. Russians must learn to unite order and liberty in a manner fitting that country’s history and political culture. March 1917 is a model of what is to be avoided. Solzhenitsyn is never with the reactionaries or the revolutionaries but rather with those liberal conservatives who want to truly govern while respecting basic liberties. As Krivoshein, a friend of Rittikh and a former minister himself, says in Chapter 117, good men must reject both the spirit of rebellion and the temptation of tyranny and pursue the path of statesmanship. Stolypin, the liberal-conservative reformer and the last great hope of the old regime, showed how one might assume what he called “the burden, grief, and joy of responsibility.” Stolypin might have continued that path, had he not been gunned down by a double agent in the Kiev opera house in the fall of 1911. His fateful death contributed mightily to the acceleration of the Red Wheel. Solzhenitsyn describes the complete blindness and ineptitude of the officials in the Duma, who established a Provisional Committee that would soon become the short-lived Provisional Government. That government would almost immediately be outmaneuvered by the revolutionary Soviets dominated by Mensheviks and Bolsheviks. The future leader of the government, Alexander Kerensky, was much too pleased to be acting capriciously in the name of “revolutionary law.” Thrilled by his own loquaciousness, he had no sense of the likely tragic outcome of this drama. All in all, he was quite repulsive. Elsewhere, Solzhenitsyn speaks of the men of the Provisional Government as “spineless mediocrities” who governed Russia for a total of minus-two days. They lost power before they ever achieved it. So much for the legend of a flourishing Russian democracy in the spring of 1917. This is a myth—or rather a lie—that finally deserves to be put to rest. The final chapter of Volume I of March 1917 is one of its most poignant. Grand Duke Mikhail, the tsar’s brother, is awakened in the Winter Palace by his loyal footman, who tells him the building is under imminent assault. Mikhail must flee the building with the growing awareness that he is fleeing for all his ancestors, including his grandfather, the tsar-liberator, who died in that palace after a brutal terrorist attack in 1881. The old order has gone and the present tsar has done nothing to defend it. Mikhail’s farewell to his footman is particularly affecting. What awaits Russia is not democratic bliss but 70 years of totalitarian mendacity and the death of 30 million human beings. 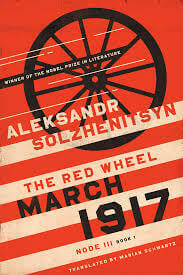 The remaining volumes of The Red Wheel will tell the story of the further descent into chaos and the concomitant rise of a totalitarian regime whose ubiquitous symbol was the Gulag archipelago. In Solzhenitsyn’s view, the old order needed to both reform itself and defend itself, but it lacked the will to do these things. Solzhenitsyn uses all the power of literary art to portray the woefully anemic character of the tsarist order, incapable as it was of initiating—or sustaining—action of any sort. This action-packed account, beautifully translated by Marian Schwartz, tells the story of one moment in which the failure of good men to act made all the difference in the world. The University of Notre Dame Press is to be applauded for making the remaining volumes of The Red Wheel available to the Anglophone world. This review was originally published with the same title in The National Review on November 27, 2017. Daniel J. Mahoney is a Board Member of VoegelinView and holds the Augustine Chair in Distinguished Scholarship at Assumption College in Massachusetts. He is the author of The Liberal Political Science of Raymond Aron (Rowman & Littlefield, 1992); The Conservative Foundations of the Liberal Order (ISI, 2011); The Other Solzhenitsyn (St. Augustine's Press, 2014); and The Humanitarian Subversion of Christianity: Why the Christian Religion is Not the Religion of Humanity (Encounter Books, forthcoming).